Well lots of people have been asking for Dave and John's favorite recipes, and here you have a few of them for this season! Mix in wine, soy sauce, Worcestershire sauce, rosemary, cloves and use as marinade for meat. Marinate at room temperature at least 1 hour, or in refrigerator for up to 6. Spread Dijon mustard over beef and press black pepper into top. Bake in a 450 degree oven in shallow backing dish, for approximately 25 minutes for medium rare. Season beef with salt and pepper. In a large ovenproof skillet, melt 2 tablespoons of butter over medium heat. Add beef and brown on all sides. Place skillet in 350 degree oven for about 20 minutes, turning beef periodically, until cooked to medium rare. Remove pan from oven and place beef on a plate, covering with foil. Place pan on stove over medium heat. Add wine and simmer for 2 minutes. Add remaining 6 tablespoons of butter, garlic and parsley. Simmer for about 5 minutes until slightly thickened. Slice beef into 1-inch slices and serve with sauce on the side. Mix ginger, brown sugar, bourbon and allspice in a bowl and set aside. Preheat oven to 425 degrees. Slice ham with a very sharp knife making diagonal lines in both directions creating a criss cross design. Insert meat thermometer centered in thickest part of ham. Place ham in a pan and just a small amount of water. Place pan in oven and bake at 425 degrees for 20 minutes. Remove water. Turn ham over. Brush with glaze mixture. Bake for an additional 30 minutes. Reduce oven temperature to 375 degrees and bake for about 15 minutes longer or until meat thermometer registers 160 degrees. Remove ham and let cool for 15 minutes. Slice and serve. In a Dutch oven over medium heat, sauté garlic in oil for 1 minute. Add the roast; brown on all sides. In a small bowl, combine vinegar, tomato juice, tomato paste, brown sugar, salt and peppers; pour over roast. Cover and simmer for 2 hours. Add carrots and onions; cook over low heat for 1 hour or until meat and vegetables are tender. Remove to a serving platter and keep warm. Skim fat from pan juices. Add water to juices to measure 3 cups. Mix flour and 1 cup cold water until smooth: stir for 2 minutes. Season with salt and pepper. Slice roast; serve with vegetables and gravy. Makes 14-16 servings. Combine 2 tablespoons flour, salt, pepper, bay leaf and thyme; rub over entire roast. Place roast with fat side up in a shallow roasting pan. Arrange vegetables around the roast. Pour 2 cups cold water into pan. Bake, uncovered, at 325 degrees for 1-1/2 hours, basting with pan juices every 30 minutes. Sprinkle roast with brown sugar. Bake 30 minutes longer or until a meat thermometer reads 160 degrees. Remove roast to a serving platter; keep warm. Strain pan drippings, reserving the broth to measure 1-2/3 cups. Pour into small saucepan and add the remaining 2 tablespoons of flour. Stir until smooth; bring to boil and let simmer for 2 minutes, stirring occasionally. Serve with the roast. Makes 10 servings. Pre-heat cast iron skillet on medium. Partially cook shallots, then add butter, olive oil, garlic and wine; cook until reduced by more than half. Pour off shallot mixture into heat-proof cup. Increase heat to medium high until pan just barely starts to smoke. Place steak in pan just barely starts to smoke. Place steak in pan for about 3-4 minutes for medium-rare depending on thickness and temperature of steak. Pour shallot mixture on steak. Salt and pepper to taste. Service Area: Mauston, Baraboo, Waunakee, Reedsburg, Richland Center, Viroqua, Montello, Wautoma, Pardeeville, Poynette, New Lisbon and surrounding communities. 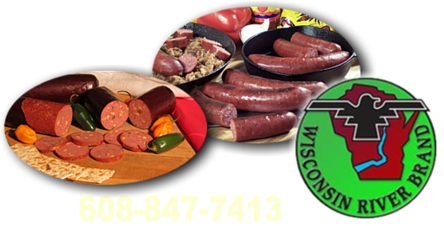 Page Summary: Wisconsin River Meats offers Mauston beef recipes, Baraboo steak recipes, Sparta beef roast recipes as well as steak recipes, recipes beef, recipes with beef, roast beef tenderloin recipes, beef steak recipes, beef tenderloin roast recipes, for Mauston, Baraboo, Sparta, Tomah, Reedsburg, Black River Falls, Prairie Du Sac, Sauk City, Lake Delton, Wisconsin Dells and surrounding Wisconsin communities.